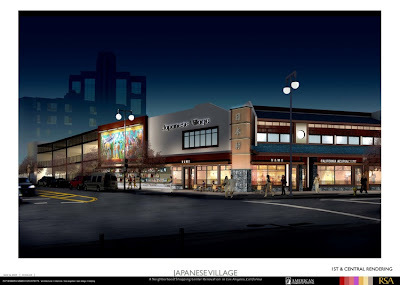 Japanese Village Plaza architects have recently released proposed renderings of remodeling work to the outdoor retail center designed in 1971, which was purchased by American Commercial Equities over two years ago. These images were presented by the owners and their architect to the Little Tokyo Community Advisory Committee of the Community Redevelopment Agency of Los Angeles which approved the proposed improvements last week. This phase of the improvements is scheduled to begin after Nisei Week with completion in early 2010. 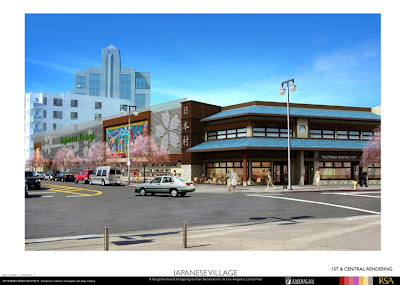 The image perspective is from the Japanese American National Museum, suggesting a new storefront opening at the Central Avenue and First Street wall and shifting the Little Tokyo mural down the facade. Thanks to Ron Fong for the tip.